21st Annual Celebrate Art! Celebrate Coffee! This is the 21st year for our festival and we are excited to announce that we have decided to move the event to Kennedy School. We moved it last year at the last minute due to bad weather and we received such favorable comments that we decided to move it permanently. No wind! No bees! No threat of rain! We will have a large tent in the parking lot with picnic tables and the food vendors will be around the tent. 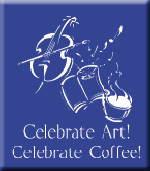 In addition to the entertainment, the festival will feature a juried art show and sale, artists’ demonstrations, free hands-on make and take activities for kids both big and small, a food court, and, of course, free coffee all day! This activity is made possible in part by a grant from the SW MN Arts & Humanities Council through an appropriation from the MN State Legislature with money from the state’s general fund. This activity is also funded in part by a grant from the Willmar Area Community Foundation and our sponsors. In keeping with the tradition of having something for all ages, we will be having a tent of “make-n-take” art activities for kids both big and small. This year’s poster artist is Kari Weber of New London. The poster and other raffle art will be unveiled August 2, 2018, in the Event Center at the Barn Theatre. The unveiling is at 11:30. Everyone is invited to attend. Raffle tickets are $2. The drawing for the art will take place the day of the festival at 3:50 pm. You need not be present to win. Other Events to Help Celebrate Art! Celebrate Coffee! Willmar Noon Lions: Belgian Waffle Day. Willmar Community Center 7:00 am – 12:30 pm.